Last week we received an animated email from an upbeat Craig Spencer, Warden of Olifants West Game Reserve, in which Tremisana Lodge is located. Craig informs us that a Black Rhino calf was born in our reserve during the last week of April 2014. You may recall that, as part of the project to expand the range of this critically endangered species, a group of 19 Black Rhino were translocated to Olifants West. Our reserve was chosen because the vegetation in the area includes large expanses of Commiphora bush to which the Black Rhino is particularly partial. In his email Craig informs us that the baby rhino was first observed on Rome 1, a property belonging to our good friend Wynand Britz, where we enjoy traversing. Craig’s instruction is to minimise human contact with the newborn rhino as excessive disturbance not only stunts the young rhino’s growth (energy lost as a result of hiding and trying to get away from spotlights and noisy excited guests) but also may cause the mother to abandon the calf. The Black Rhino, Diceros bicornis, is regarded by the Viva Safaris guides as the one animal, along with buffalo, that must be treated with the utmost respect on our Bush Walks. As I have stated in a previous newsletter, I believe that it does not deserve to be labelled as “very aggressive”. I think it is better described as “very inquisitive”. We have noted on our walks that the Black Rhinos that have moved towards us do so because they want to know what we are. Once they have established that we are not a threat, the rhinos have generally lost interest. The reason they charge and get up close is because they have poor eyesight. The birth of the rhino calf is wonderful news as I was told recently that the Kruger Park Black Rhino population has dropped from an estimated 1000 four years ago to only 600 animals. The poaching epidemic has now reached the level where I am reasonably certain that within 10 years, Black Rhino may well be extinct. I am told that at any one time around full moon there are up to 6 armed poacher gangs operating in Kruger. These are mainly from Mozambique where the kingpins now lead lavish lifestyles. Surrounded by other Mozambicans mired in poverty, the poachers are admired by the locals who also aspire to similar lavish lifestyles. What this means to me is that shooting and killing poachers will not be as effective a deterrent as was previously believed. Others who want the life of luxury will take a chance with their lives and replace those killed. I understand the SA authorities are seeking permission to launch cross border raids. What is required is for the Mozambican authorities to effectively control the poachers. The heady ideal of a transfrontier park must be revisited and I hope that the fence along the SA / Mozambique boundary is not only replaced but constantly patrolled. It is our God-given duty to protect all of His creation and it will be a very sad day when the last Black Rhino in Kruger is shot. The rain at the beginning of April just took the dust away and said goodbye to the warm summer days until next time. Around the lodge we have regularly sightings of zebra and impala. There are four elephant bulls that visit every day at the lodge to drink water at the waterhole in front of the guest house. Afterwards they usually move towards Tremisana Dam to take a mud bath. Small creatures are busy working hard to collect food for winter. On a recent bush walk I came across a large number of ants collecting grass to store in the nest. The grass seeds remain in the nest until it rains again. The ants then become agitated and excrete formic acid that stimulates germination of the seeds. This symbiosis is a fine example of nature’s ability to maintain a delicate balance through the interaction of all facets of nature, both great and small. Our bush walks now start at 05h15 in the morning. When we leave it is still dark and a bit cold. It is good because we have an opportunity to use a spotlight again trying to find nocturnal animals. On Oxford main we spotted two black backed jackals eating a small Steenbuck. On the Olifants River most of the hippos are grouped together and the bulls are starting to mark their territories, because the water level is dropping. 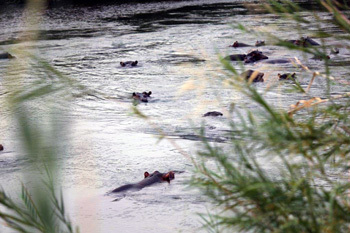 When we arrived at the river we spotted a large number of hippos. We were very close to the hippos and took beautiful pictures. The guests enjoyed the sighting and asked to stay a little bit longer listening to the hippos vocalising. We drive out while the sun is just rising – it is stunningly beautiful ! We located elephant tracks and saw fresh elephant dung and knew the elephants were very close by. A few minutes later we found a large herd of elephants. The herd was relaxed and milled around, shoving each other gently to reach the best branches, their trunks searching, curling, swishing at a time entwining as if in a knot, all the while watching over three calves in the herd. One of the three calves was born a few days ago and he was therefore much smaller than the other two. He is doing very well. We followed them until they got to the dam and started drinking water and taking a bath. It was one of the best sightings and everyone enjoyed it. During breakfast everyone kept on talking about it. Along Olifants road we have had some leopard sightings – usually walking along the road or stalking impalas. 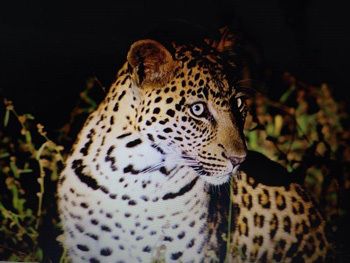 A young leopard lives very close to Tremisana Lodge and we love the great sightings. This month, like all the others, has been filled with amazing sightings at every turn. I thoroughly enjoyed a few brilliant days in Kruger Park and I had my first 5 out of 5 in one day!! Balule has also been amazing with a significant increase in leopard sightings. As winter approaches the bush starts getting more active as the bush dries up. Like all the drives, my guests and I all started with eager hearts hoping to find anything that the bush would surprise us with. Before the drive, I had spoken to Chris who had just done an afternoon drive. He had found general game with the odd elephant here and there. So I thought to myself today might be one of those quiet days but it’s often on days like this that the bush surprises you! So the guests and I set off hoping to find something and we made our way to the beautiful hide where often I’ve found elephants, buffalo or on the rare occasion black rhino. To my great disappointment we found nothing – not even an impala (we all know that to not see an impala is a rare thing). From the dam wall we saw a herd of impala running frantically into the river bed. They all stopped and looked in one direction so instantly I knew there must be some predator. We drove around the corner to go and check and to our great surprise there were two beautiful lionesses. I think they had attempted to catch an impala that is why the impala were so frightened. We stayed with these beautiful leonine ladies for about thirty minutes before they got up and tried unsuccessfully to catch a warthog that had wandered into the area. The guests were ecstatic – it was truly a wonderful way to start the drive ! Not even 1km away from the lions we located a young teenage bull elephant. Despite being a teenager he was fairly relaxed and didn’t care too much about us as long as we stayed at a respectable distance. He wandered into the thick bushes and I thought for sure we had lost him but I thought I’d try another road and maybe get him crossing there. To our surprise he had crossed the road already and had wandered into a massive open clearing with the beautiful golden sunset as a backdrop which made the sighting even more enjoyable. We sat with this beautiful giant for quite a while watching him break apart a bushwillow tree before the darkness descended onto the bush. 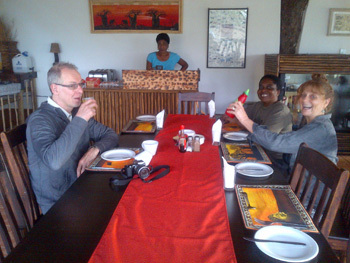 After the elephant sighting we started making our way to the boma braai where we had a wonderful filling dinner. On our way back to Tremisana all the guests asked about the elusive leopard. About 3 minutes away from Tremisana Lodge everyone had basically given up hope and wasn’t really expecting much, but then right next to the road a beautiful young male leopard sat there almost as if he had been waiting for us to drive past. Possibly the most relaxed young leopard I’ve seen in a very long time, he wandered about 5m into the bush but still a 5 out of 5 visual. He did put on quite the show for us with the odd yawn or a good stretch every now and then. Again, almost as if he had it all rehearsed, he stepped closer towards the Landcruiser emerging from the tall grass and peering at us through the thin strands of grass before disappearing into the darkness. Wow ! This was an awesome night drive and to see both lion and leopard on the first night drive was incredible both for the guests and me personally. As winter approaches sightings will get even better allowing us to take even more beautiful photos – I can’t wait. The wide open expanses of the Kruger Park provided some memorable sightings : my highlights all include members of the Big Five, except for one of my personal favourites : the Honey Badger. While approaching Satara, I was given a tip about a lion sighting along the S100, a road well known for its big cats. We headed off – it didn’t take long before we noticed many vehicles ahead of us, with long camera lenses sticking out windows, a giveaway sign of something interesting. Sure enough not far off the road we saw the first lion and then not long after the second and eventually we had all five lions moving towards our open Gameviewer. My guests loved it ! Often, while looking for the big cats, one forgets about things like rhinos. It was while checking an area for a reported lion sighting that we came across my next highlight. We were following up a lead on a lion sighting on the S90, so off we went eager to find the big cats. This route is always a beautiful drive with wide open spaces interspersed with riverine thickets – a good place for cheetah as well as white rhino. We also came across a lot of general game like giraffes, warthogs and a wide variety of birds. We reached the spot where the lion were said to have been a little earlier in the day, but they were gone. On the way to Timbavati we spotted a small herd of buffalo. Shortly thereafter we found ourselves looking at a crash of six White Rhinos, a stunning sighting one which my guests really found incredible – they could not believe what we were witnessing ! Late in the afternoon while driving along the Sweni road, I had a glimpse of a small creature along the side of the road. I had been hoping to see a honey badger for months with very little luck, and there right alongside the road scratching through the tall grass, was a very busy honey badger. My guests were just as excited as I was – it really was the cherry on top of a very good day in the Kruger. The Balule game reserve once again provided me with some excellent sightings. The highlight was a leopard sighting. After stopping under a starlit sky for dinner, we headed back towards Tremisana Lodge along Olifants road for the finishing touches to an excellent evening out. We managed to spot the ever present chameleons, clinging to ends of branches, trying their best to look like leaves. Towards the end of the drive, almost back at Tremisana Lodge, we found ourselves alongside a beautiful leopard, as calm as can be, right next to the road. Some of the other Viva guides are also having good sightings of this leopard and I understand he drinks from the waterhole in front of Tremisana. The guests and I couldn’t believe our luck – we continued to watch him move slowly along the road and eventually move off into the thick vegetation. Leopards are normally very shy so my guests were very lucky to get some excellent photos, giving them a great start to their safari. 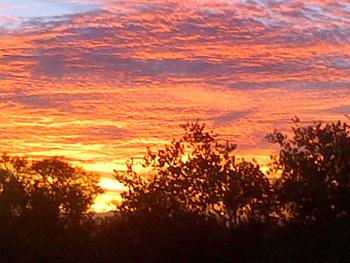 The morning air is becoming chilly, but completely worth braving for the excellent sunrises as well as good sightings. It’s always great to see lions on a drive but even better when it’s your expressed goal for the morning. The search for the lions began with an excellent view of several female giraffes feeding on a very thorny knob thorn tree, one of their favourites; not long afterwards I heard a very promising update on the radio, and sped off to investigate. As we snuck round the corner, there on the road ahead of us, looking very content with life were four big lion cubs. We sat and watched them as they yawned and slowly mustered up the energy to move off into the bush following their mother. My guests were able to get some great shots and were thrilled with the sighting. On the 2nd of April I conducted a full day safari in Kruger National Park. As we arrived at Orpen gate there were three elephants walking around close to the parking area. 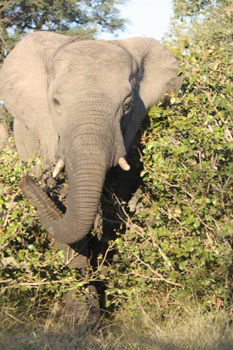 There is a big Marula tree there and the elephants were looking for amarula fruits. They were busy smelling and looking around but it was all in vain. They even shook the tree in a desperate attempt to get some fruit but nothing fell out as the season for Amarula fruits is usually between December and March. Near Satara at Nwanetsi River bridge we had a great sighting of a male lion feeding. On our way back we took Rabelais. There were twenty giraffes galloping along the road. They seemed to be running away. Later on we drove into eleven rhinos. Wow ! I switched off the engine until we got close. Two young ones ran into the bush and the mother followed. We drove on for about four kilometres and we came across a large herd of buffalo crossing the road. My guests were very pleased with the day’s sightings. On the 7th of April at Timbavati Picnic spot we saw four young elephants fighting along the Timbavati River. We also saw some hippos on the sand bank. There was a crocodile basking in the sun with his mouth wide open. On the Olifants – Satara road we came across a herd of buffalos about a hundred metres away from the road. After lunch at Satara we took the Sweni road – a kilometre along the way we came across vultures. Some were on a tree and some were flying down to the ground. We believed it was leftovers that they were feeding on because two days earlier we had spotted a male lion eating a blue wildebeest close to that spot. Along the Sweni road we had a White Rhino cross in front of us. On the S36 we saw a herd of buffalos walking along the road. The herd included young calves that were struggling to keep up. Some were only a few days old. At Rabelais waterhole we saw three lionesses resting on the road. One lioness had a tracking collar and another had scratches all over her body. They all were looking very thin. April has been a super exciting month and it seems all the animals are starting to congregate together as winter approaches. We have had some amazing sightings such as the white rhino, eagle owls, many leopard sightings and even lions hunting right in front of our vehicles. Normally heading out in the heat of the day one can struggle to find animals but on 17 April the bushveld seemed like a zoo. 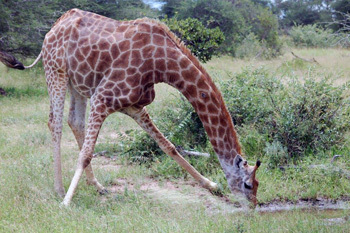 As we started the drive we were greeted by two giraffes drinking water at the waterhole at Tremisana Lodge. We then proceeded to the airfield, where we usually find some animals that like the open area as it provides early detection of any predators. At first I thought that due to the heat the animals had probably moved to the shaded areas, there came a blue wildebeest running straight at us from the thickets. A couple of guests started panicking as they had thought at first sight it was a buffalo charging towards us. As the wildebeest got closer it was clear that he wasn’t doing his daily exercise but that he was being chased by something. We realized the poor fellow was being chased by two massive lionesses. I immediately switched off the Landcruiser and we waited. The old male wildebeest seemed to be using our vehicle as a distraction and it sure worked in his favour. The lions turned back giving us a chance to take some great photos. They came straight past our vehicle and spotted a lone warthog on the other side of the plain. They went straight for it but the chase didn’t last long as the warthog spotted them from a distance and ran away for dear life. For the rest of the month leopards seem to have been moving in from all directions with several good sightings. In the month of May the bush will get much clearer and it is exciting knowing that even though the temperatures will be dropping the sightings will constantly improve. I had six guests on a Kruger Park safari. The atmosphere was great because the guests were excitedly taking pictures of everything. The first sighting was of two big elephant bulls fighting and pushing each other right near our vehicle. About 2,5km from Orpen gate we saw three big male lions crossing the road. On Rabelais road we saw four white rhinos. Just after BobejaanKrans view point we saw two male and two female lions. Along Timbavati we saw a lot of vultures feeding on a carcass of a kudu. On the S90 we saw a huge breeding herd of buffalos drinking water. 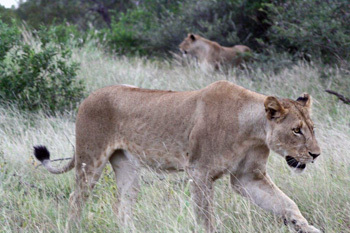 On the H6 near Sweni we saw a pair of mating lions about three metres away from the road. On Sweni Road we saw two cheetahs. At Mudzadzeni we saw a lot of elephants as well as two giraffes fighting and the guests were so excited to see them. What a fantastic day of game viewing ! On the sunset drive we saw six big elephants in front of Tremisana Lodge – it was the massive bull, Ezulwini and his friends. The drive was excellent because we also saw a male leopard on Olifants main road on our way back from Marula Boma. We saw two hippos in Ngwenya dam and a breeding herd of elephants in and out of the water. 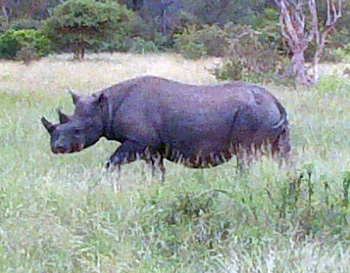 On Sable road near Ezulwini Billy’s Lodge we saw one Black Rhino. We saw three female lionesses sleeping on the river bank and it seemed as though they had just finished eating because we could see vultures flying around. During the morning drive we saw two jackals trying to catch a scrub hare on the Airstrip. During a bushwalk on Oxford we saw a big buffalo bull and it started running towards us. Luckily enough we were on top of the rocks. After that sighting we saw two hippos fighting in the water. On our way back we came across a herd of elephants in close proximity to our vehicle. We also saw a lot of giraffes, zebras and of course impala. There was one zebra that really caught our attention. It had a deep cut on its backside. 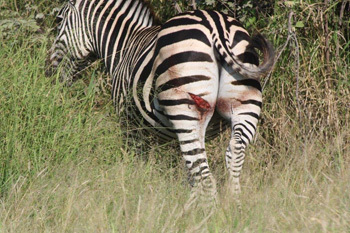 The guests were deeply touched and one even asked if there was something that could be done to help the zebra. Unfortunately we cannot interfere in the circle of life in the bush veld. One day in Kruger we were busy viewing six giraffes including a dominant male when a nomadic solitary male giraffe arrived on the scene. The dominant male from the group of six approached the new arrival. Moving gracefully, he extended his neck, lifted his nose and approached the new arrival. The fight started and my guests were very excited. It was such a spectacle to watch such a classic engagement in a fight of horns and necks. On the Rabelais road we had a brilliant sighting of a pack of twenty six Wild Dogs. The dogs located a herd of buffalos in the bush. When the buffalos detected the presence of the wild dogs they immediately stopped feeding and herded the calves in the centre of the herd. The buffalo cows started chasing the wild dogs. The wild dogs spread out in to the bushes and kept on coming back continuously trying to disperse the buffalos so as to be able to corner one of the calves. The wild dogs continued to harass the buffalos for close to ten minutes. We sat there expecting some real drama but unfortunately nothing happened. The buffalos put up such a resistance that the wild dogs gave up and went away. While doing another day in the park we heard baboons calling loudly along the Timbavati River. We stopped to listen and we saw zebras come across the road at high speed. Some Nyalas followed running fast. About five minutes later a lioness emerged from the bushes. She stopped in the middle of the road looking and listening. After the lion sighting we saw a beautiful lilac breasted roller perched on a tree top. We were busy admiring the bird when out of the blue an elephant came out of the bushes. It was so close that the guests were startled by the young fellow. After a few seconds more elephants appeared on the scene. It was a great experience having the big animals so close. We came across a flock of seven ostriches, two males and five females busy feeding near Kingfisherspruit. The two males were busy chasing each other and biting each other. They were making a loud noise. Later on we saw a leopard crossing Girivani road carrying a young cub in its mouth. The cub was still very dark in colour. Towards the end of the day we saw a Black Rhino cow with a calf running in front. The calf was about three months of age. On a drive in Kruger National Park at Phelwana Mud wallow we came across a large number of elephants. They were all over the place. There were two young bulls busy fighting until a bigger male bull arrived on the scene. The two stopped their fighting when they saw the big bull. The big bull lifted his trunk and flapped his ears and the two instantly went their separate ways. On an evening drive at Tremisana we first saw a buffalo walking along the road. We also saw an Aardvark on Olifants main road. This is an extremely rare sighting and I don’t think my guests fully appreciated what they had witnessed. The tables and chairs at the Breakfast Lapa have been repainted. 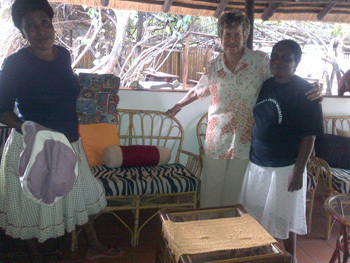 Gerda Britz has been an inspiration and the general improvement in décor has dazzled staff and guests alike. We have daily visits from giraffe and elephants and there are two honey badgers visiting the waterhole in the late evenings. Ronald reports that Janetta Viljoen has brought her massive experience in the hospitality industry to the fore. Marc’s Treehouse Lodge has had a big face-lift. Treehouse 1 has had a complete makeover. The bridge over the stream to treehouse 1 has been replaced and another bridge has been erected across the waterway between treehouses 6 and 7. I believe Janetta took an awful spill in the mud one rainy day and immediately sorted this out. The vegetation in front of each and every treehouses has been trimmed so as to allow the guests on the decks to really enjoy the views of the Klaserie River and its many animals. Now that the nights are getting colder, the staff are realising exactly why I had the Marula Boma braai built as we did – all the clients can stand around the fire to warm up. Viva Safaris is very proud of our involvement with the local communities. We run a clinic coordinated by Trevor through Bongani and a soup kitchen coordinated by Sandy through Father Jose at the Catholic mission in Acornhoek. As mentioned in one of my previous newsletters, one of our past guests, Cathy Martin, booked a safari with us a few years ago and learnt from Ronald at Marc’s Treehouse Lodge that we do charity work and offer volunteer safaris. She was taken up by the idea and has done great work. She has recently raised 1000 Pounds sterling for the continued education of over 350 pupils at Green Valley Primary. 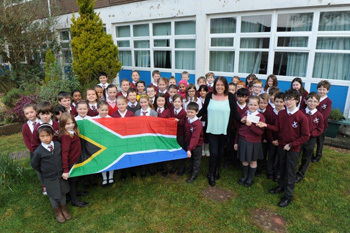 The pupils of St Andrew’s Primary school in Glasgow, Scotland have again shown amazing generosity in raising funds for the pupils at Green Valley School in Acornhoek. In the photo the children present Cathy with a cheque in an amount of 850 pounds sterling which she will use to buy computers and other school aids. Cathy will be staying with us for about a month in June during which time she will continue her great humanitarian work – we look forward to welcoming her and her fiancé, Tom. (Tom proposed to her at Marc’s Treehouse Lodge – see previous newsletter). I am involved in another fundraiser – this time for the cash-strapped Capuchin Convent. The Poor Clare Capuchin nuns are a contemplative order and have limited ways of earning money. Together with Laurence Saad, owner of the 5 star Ezulwini lodges (which Viva Safaris use for our luxury safari programs, along with Pondoro Lodge) Viva Safaris is raffling a 5 day 4 night luxury safari for 2 people. YOUR REFERENCE must be a cell phone number to which I will send your ticket number. The winning ticket will be drawn by Father Emil of Radio Veritas on one of his programs in July. I would like to thank the de Villiers family, owners of Drakensig Service Station, who generously donated a package of Easter goodies for our orphan program. We had the most amazing trip and I really enjoyed my stay at the lodge. I am definitely coming back soon. The staff was great and made us feel welcome from the time that we arrived. The sunset drive was fantastic and we loved seeing the African sunset. We saw a lot on this drive and we loved the braai underneath the stars. The bushwalk started early and we had a fun filled walk. We enjoyed our visit to Tshukudu. The day in the park was our highlight. We made the big five. We definitely know the place we are coming back to for our next vacation next year. Thank you for the great service. Five star rating in my books. Marc’s Treehouse Lodge was an incredible experience! The website does not do this place justice. I was lucky enough to get room/cabin #1 which is right down by the river bank. I was travelling alone, so the room was a single occupancy. 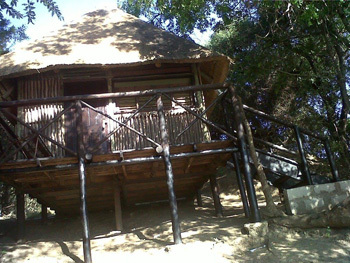 It was absolutely the most beautiful cabin in the African bush. This would be a great place if you are on a honeymoon or going for a romantic vacation. The sounds of the African night – the monkeys playing in the trees, the water from the river below, the hyenas crying in the night, and the insects from all around made it just the perfect rustic experience. Now please note, if you are a “luxury lodge” person, this is definitely not the place for you. You might need brick walls, luxury towels and soaps and little chocolates on your pillow. This was so much better than that! This is the way I wanted to enjoy Africa in its true form and I had the opportunity to do that. If you are the same way and want to experience Africa from a more minimalist point of view and be more at one with nature, then I highly recommend Marc’s Tree House Lodge. The staff is great- especially Pretty! She is the cutest, stylish South African I saw my entire trip! She is adorable and was always very helpful and seemed to care a lot about our group’s happiness and well being while we were there. The food was also excellent! They always had alcohol in the fridge so you never have to worry about that. I highly recommend this place and when I come back to South Africa I would love to stay here again!